(Nanyang, Henan—Jan. 31, 2018) A government office in China’s southwestern Henan province released an announcement on Monday, asking residents to report “illegal religious activities” via a hotline, guaranteeing their confidentiality and offering cash rewards for factual tips. A translation of the notice has been included below. According to Articles 69 and 71 of the Regulations on Religious Affairs, setting up sites for religious activities without approval is illegal, and providing for the operations of illegal religious activities is illegal. 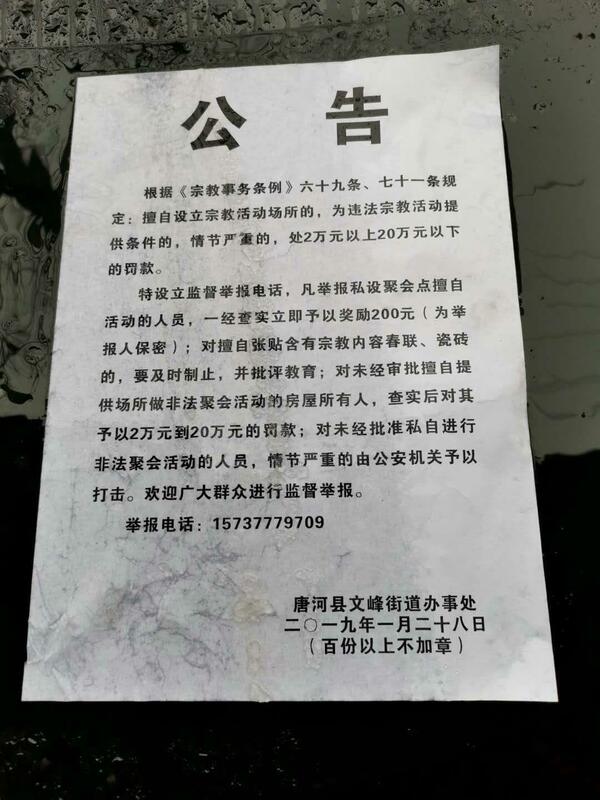 If the violation is severe, the fine of 20,000-200,000 yuan will be imposed. A confidential hotline has been established for the public to report any illegal religious activities. As soon as the report is found to be factual, a reward of 200 yuan will be granted (the reporting person’s identity will be kept confidential). 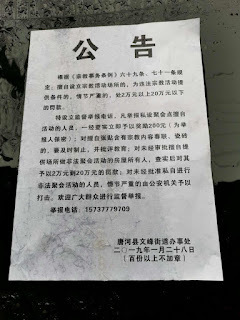 People posting any [Lunar] New Year couplets written on strips of red paper or displaying tiles with words related to religious ideology will be stopped immediately and be seriously educated. Homeowners providing sites for illegal religious gathering activities without approval will be fined 20,000-200,000 yuan upon the report being found to be factual. People conducting or participating illegal religious gathering activities shall be investigated. If the violation is severe, the public security department will impose a severe penalty. This notice encourages the public to aggressively monitor and report any illegal religious activities.